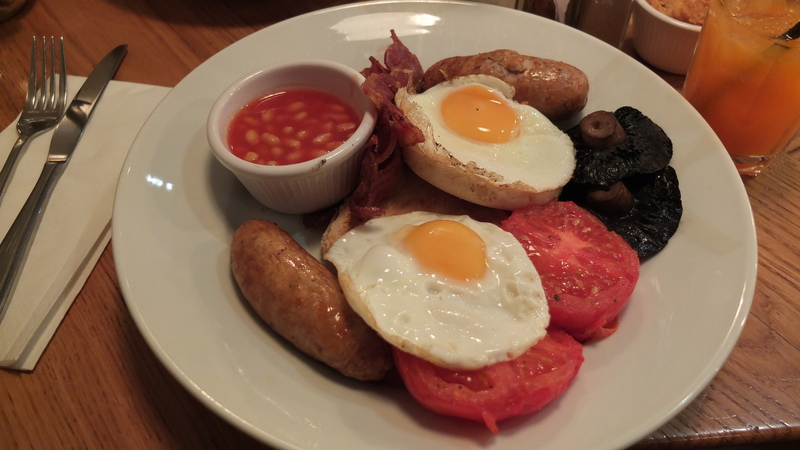 My London Trip— Restaurants you should go! I was extremely occupied with my first full-time job and settling in a new city. The worst thing is the two things I just mentioned are just excuses, the truth is I didn’t make any time to write anything in the past months on my blog. I feel very ashamed and I decided to set a goal for myself. I should write at least 1-2 pieces per month. So, this piece is about my post-Christmas and new year trip to London. I was in London for 5 days from 29th of December, 2014 until the 3rd of January, 2015. We booked the trip for 7 days, but we were very unlucky with the weather on the day of departure. It started snowing… and obviously the local airport and airline company we chosen were not prepared for the surprise. So we had to wait in the airport for more than 12 hours for a confirmation which is the flight is cancelled. I was very upset, but luckily we could arrange later tickets and still go on the trip. London is by far one of my favorite cities in Europe and I find a lot of similarities with Shanghai (where I come from). It is obviously a very big and dynamic city, you can find the perfect mix of modern, history, art and culture in literally every corner of the city. Since it was my first time in London, I was prepared to be a total tourist, I wanted to see every touristic attraction in London. However, due to the time limit, it was not possible to see everything, but it was amazing to be there and enjoy the city vibe. London is also the city I would definitely go back. I felt so lucky that I was able to attend the New Year’s Eve firework show just beneath the London eye with my loved ones. We waited for more than 2 hours in the cold with thousands of people from all over the world. The firework show was only for 10 minutes, but I felt I have seen it for hours. I was speechless afterwards, it was too amazing and impressive for words to describe. It was definitely worth the 10 pounds ticket, and I highly recommend everyone to experience once if you have the opportunity. In this post, I am not going to talk about all the attractions which probably is written in a lot of places. 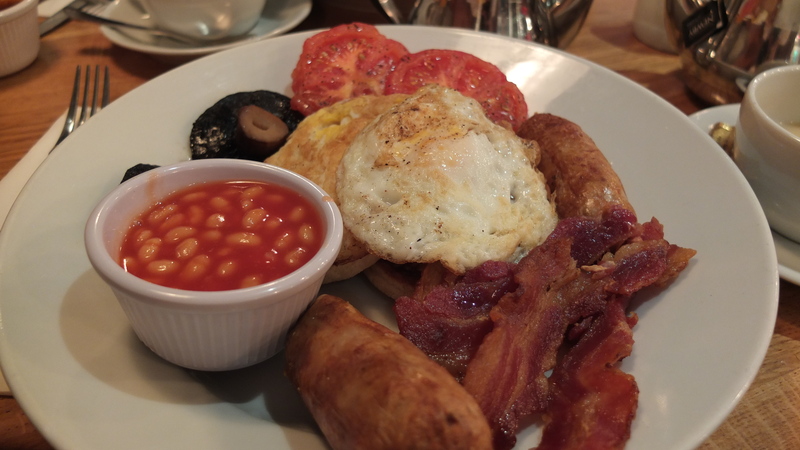 I am going to share some food tips with you, the ones I would go there again if I am in London. We went there for dinner on the first day. 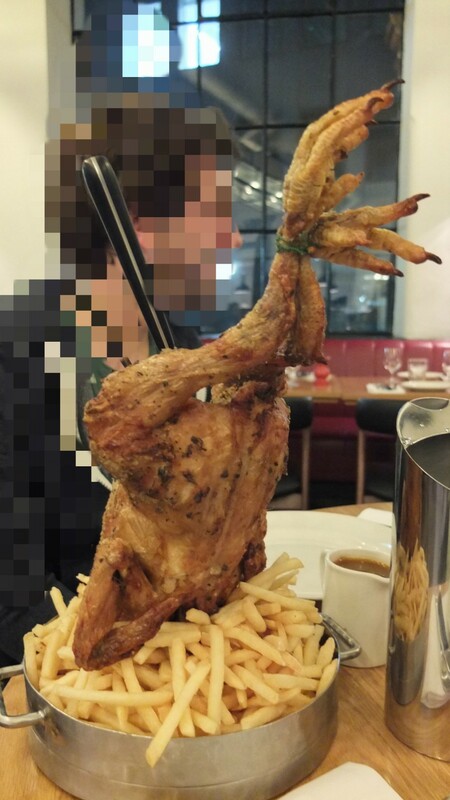 The concept was very simple, you can choose between chicken or steak, or you can have both. We are with four, so we decided to have both. The interior of the restaurant is very spacious, with very high ceiling. It is a mix of modern and old school. Service was great, fast, warm but not too over the top. It is not a cheap nor a very expensive place, I think the price and quality matches and we were very very satisfied with the food. It was one of the best dining places we have been to in London during our stay. Obviously, this is something Chinese or at least Asian judged by the name. We went there for lunch as I insisted. 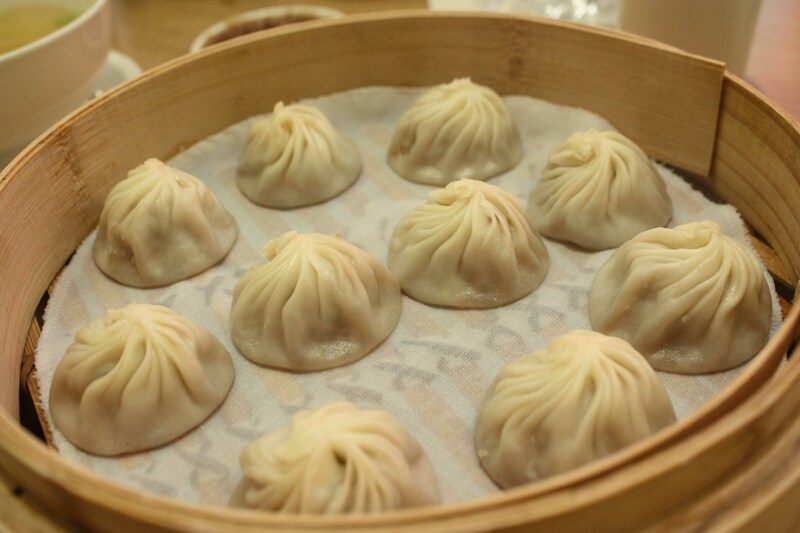 Their specialty is soup dumpling, it is also a specialty from Shanghai, we call it “xiao long bao” in China. I was craving for it long before the trip. The “xiao long bao” was not as good as what we have in Shanghai, but I mean come on, the comparison doesn’t make sense either. Of course you have the best Chinese food in China. 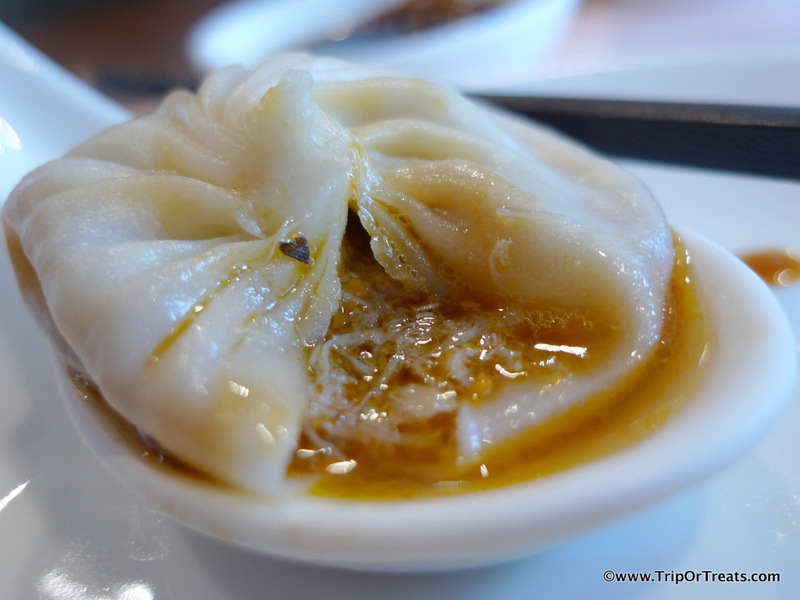 But it is one of the best “xiao long bao” I had in Europe for sure! I strongly recommend you to go there for lunch but NOT dinner. Bram and I went back for dinner once and we were so disappointed for the food and service. It is not comparable for what we had for lunch, sad :(. 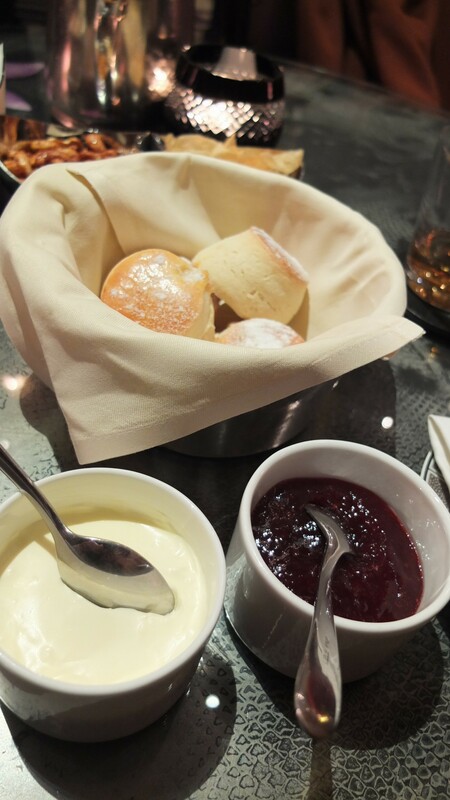 The one thing you ought to have in London: Tea and Scones! 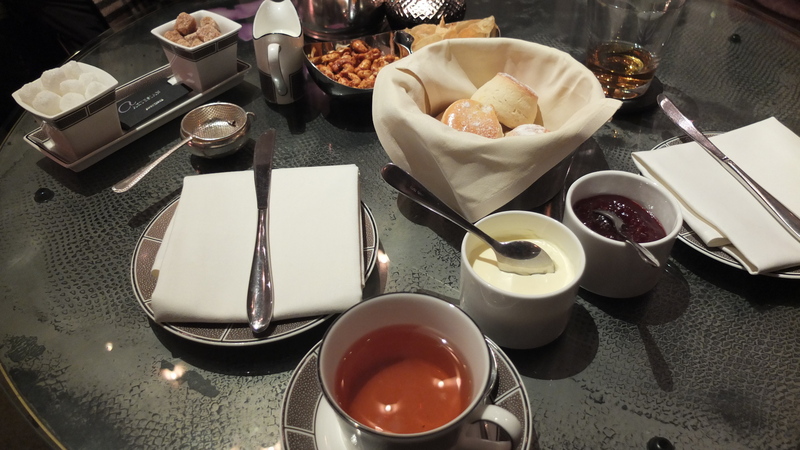 I actually booked high tea at Langham before the trip, but in the end we figured it was a bit too expensive (I think it is around 48 pounds p.p) so I cancelled it. I don’t regret it but when I saw the fully packed high tea room, I told myself I will come back here next time!! Bram and I sat in the bar of the hotel, which was apparently the bar was voted one of the best bars in the world for the past three years. I had tea and scones, Bram had whisky and a glass of red wine. It was quite fancy for an afternoon drink, but I totally loved the atmosphere. The service, needless to say, was perfect. They were very warm and kind but not snobbish. 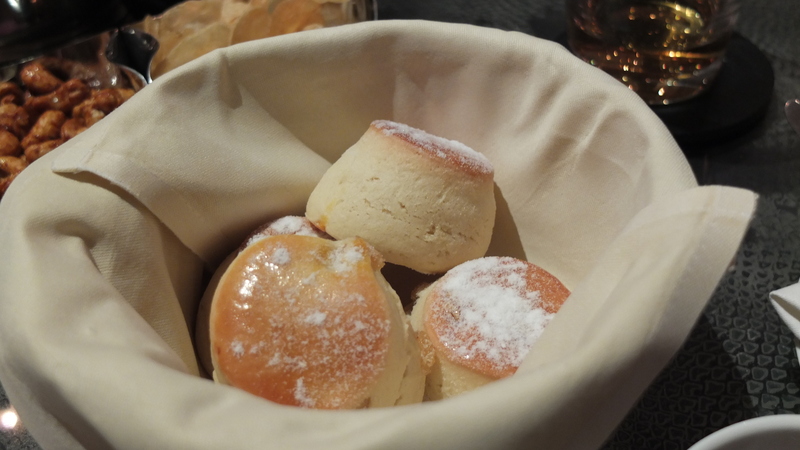 The scones was fantastic. It was still warm when they serve it, with cream and jam. They were not too sweet, very fluffy. Combine with the generous pot of tea they serve, I thought this trip could not get better. Despite all that, I am sure a lot of you will love how the hotel looks from the outside as well. Unfortunately I do not have pictures of the how the hotel looks as it was very dark when we went outside. Pot of Earl Gery was 6 pounds, 4 scones for 12 pounds, compare to alcohol, the price of tea and scones are very affordable. So, what did you miss from all the choices I have mentioned above? Yes, fish and chips! 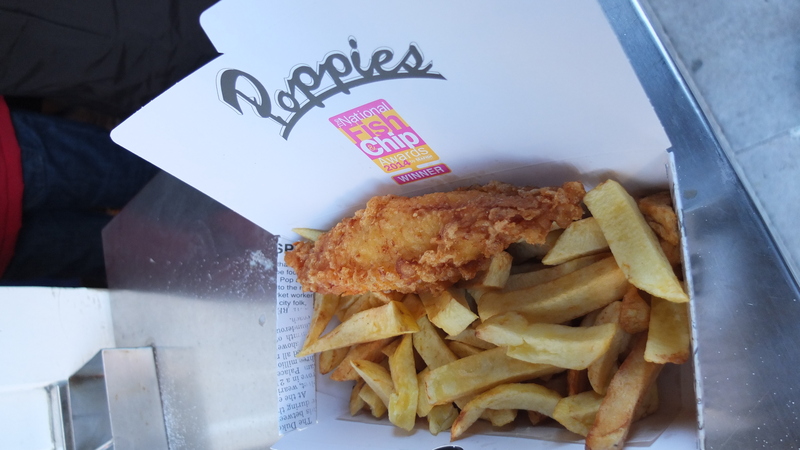 It was a coincidence that we passed by Poppy’s fish and chips restaurant. So I thought why not? Remember my last blog post was also about fish and chips? Well this time I was not in Eindhoven, I was having the authentic fish and chips in London! Of course there are many other things we have tried during the trip, but I have listed these 5 for recommendations for people who enjoys food, no matter it is street food type or fancy dining kind. I hope you enjoy this post, I will come back with the Markets I have visited in London next week. And this time, no excuses. All the pictures except the “xiao long bao” ones are taken by me, I used Fuji X10.